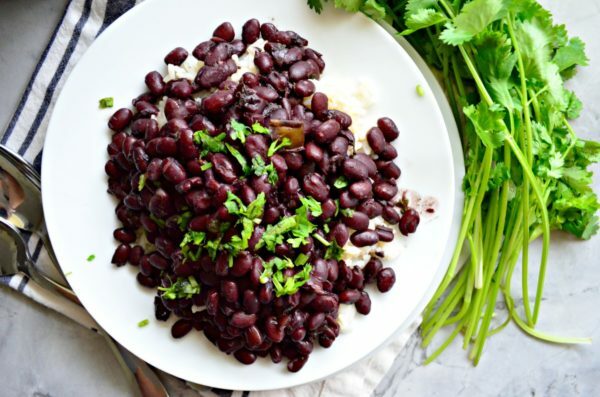 Make a big batch of fresh black bean in an hours time with my easy recipe for Instant Pot Black Beans. Freeze the leftovers for easy future meals. 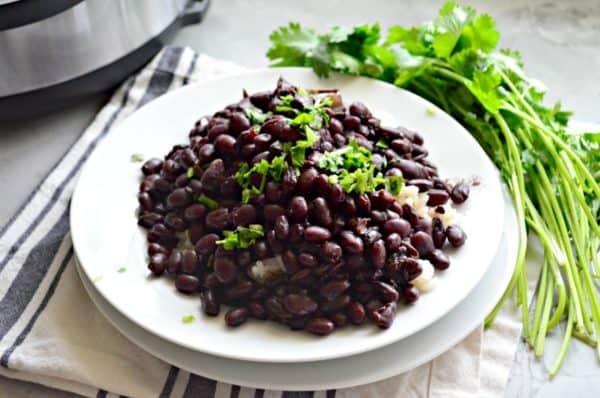 Oh am I so excited to share with you today’s recipe for Instant Pot Black Beans. Have you ever cooked dried beans? If you answered yes, then you know that dried beans require soaking. You can either soak over night or do a quick soak the same day you want to cook them. Dried beans can take hours (if cooked in a slow cooker) or a few hours (if cooked on the stove top). Let’s get real. No one has time to cook dried beans. I started experimenting with my Instant Pot and cooking dried beans. I quickly found that their was no soaking required! Hello 21st century!!! Can I get an AMEN to no soaking beans! Finally, I can cook dried beans from scratch and not have to worry about soaking. Can you tell how happy I am about this? So you might be wondering. Why the heck should I cook beans from scratch? It’s so much more cost effective to cook dried beans. You get more bang for your buck. You can portion out and freeze leftovers. You get to control everything inside the beans. Meaning low sodium and packed full of flavor. Don’t get me wrong, I’ll still hang on to a few cans of beans. But now with the Instant Pot you can find me cooking large batches of dried beans, portioning out and freezing the rest for a later meal. 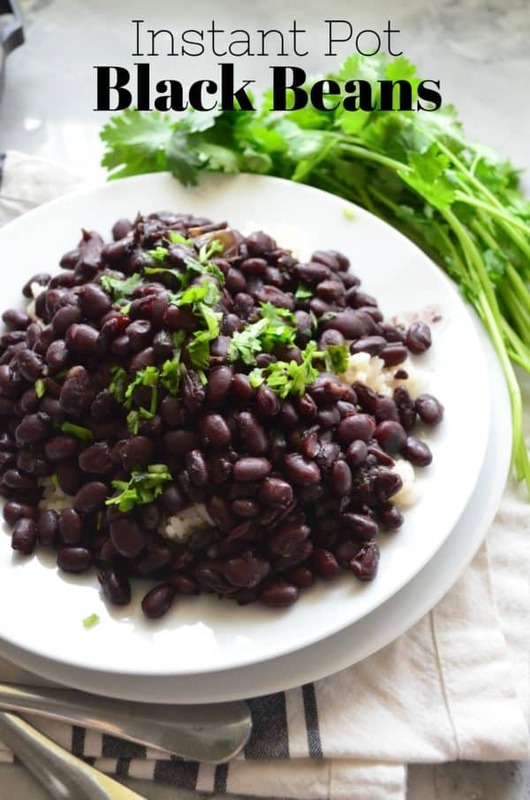 My family loved these black beans and so did I! I added additional cilantro prior to serving because I love cilantro. If cilantro isn’t your thing no need to add any extra. I like to serve the black beans on a bed of rice. However, I also will thaw some out and use to incorporate in our taco meat or for any other dish that might warrant black beans. Whatever way you want to eat these black beans is up to you. Select "saute" on the Instant Pot. Pour in the olive oil. Add the onion, bell pepper, and garlic. Saute for 5 minutes until tender. Then add in the salt, black pepper, cumin and ground coriander. Stir. Add in the dried black beans and the water. Mix well then add in the fresh cilantro and bay leaves. Mix one more time. Place the lid on the Instant Pot; lock and place pressure valve to "sealing". Select "manual" setting and cook for 20 minutes. Once the beans are done cooking, let them sit 30 minutes until pressure naturally releases. After the 20 minutes, carefully release any existing pressure. Open lid, stir well and enjoy. You’ve made me want to buy an InstaPot! I cook dry beans because I agree with you, they’re tasty and you get so much more food for your money but … they’re time consuming. I didn’t realize an InstaPot could cook dried beans in 20 minutes without soaking. That’s amazing! 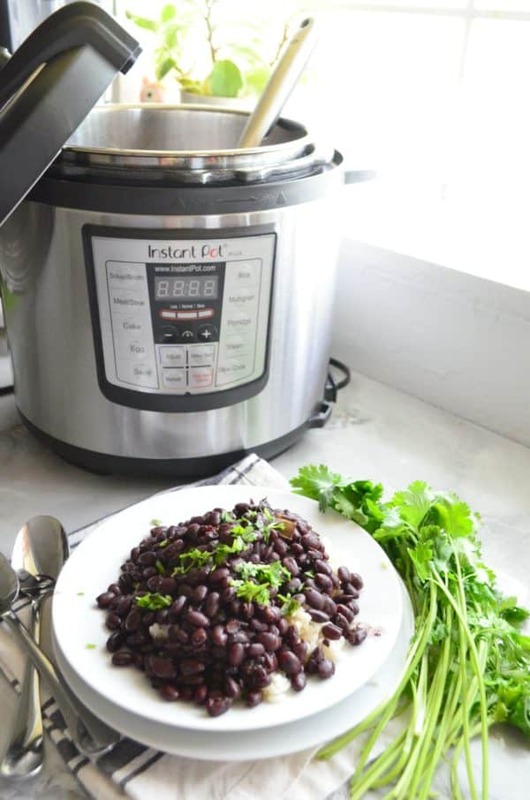 Jennifer–if you cook dry beans a lot then I HIGHLY suggest an Instant Pot just for this reason. No soaking needed! Also, I’ve made the most amazing split pea soup in the Instant Pot (recipe publishing closer to the holidays)! Do it… you won’t regret buying one!